Note: Yes, that’s my review unit Nexus 4 which just arrived, expects full thoughts later or tomorrow and a full review next week after the holiday! Also, Windows Phone 8X and Lumia 810 reviews coming soon as well! The wondrous folks at iFixit have performed yet another teardown of a newly released gadget and found some interesting results with the Nexus 4. According to the iFixit results, LG and Google did outfit the newest Nexus device with a Qualcomm multi-band LTE chip, but you can’t take advantage of it. Much has been made about the lack of LTE on the Nexus 4, easily the most powerful device to wear the Nexus name. So why is it in the phone but not readily available for our use? There’s a few theories that have popped up including that some carriers have secured exclusivity on LTE models that will be unveiled at a later date. Another theory suggested by Ars Technica and the one I tend to agree with it is that LG just used chips that were also secured for the Optimus G. LG was likely able to cut their chip acquisition costs by bulking up on their order size and using the same chip for the Nexus 4. Still, that begs the question as to why LG would add a chip that they had no plans to use at full capacity? For now, any use of a Nexus 4 on LTE would be illegal anyway as the device has only been approved by the FCC for use on HSPA+ networks. You don’t want to break any laws, now do you? Without radio firmware designed specifically for the Nexus 4 and its Qualcomm chip, any LTE chip is now dormant and will remain so. We’re well beyond something that can be achieved through the basic tenets of hacking and rooting. On a closing note, is there anyone out there that believes Google would just sit idly by and watch LTE support be passed up just because? I don’t think Google is concerned with letting LTE capability just be glossed over, there’s a reason it’s not in use and like all tech fans, we’re all trying to figure out why. Hopefully, at some point down the road we’ll uncover the real reason there’s a dormant LTE chip inside the Nexus 4 and maybe some all-star hacker can build a radio, but I’m not holding my breath and neither should you. Hmmm so if it wasn’t approved for LTE use by the FCC could it gain approval in the future and unlock the LTE radio(s) in a future firmware update? That would make a lot of people happy. Wifi Hotspot in the Lumia 710 was added with a firmware update, but I don’t think that’s quite on the same level as LTE support, but you never know. Just don’t bet on it. Look at the post on android central. It has the chip, but not the proper antennas, so no, it won’t get LTE. There are posts all over the internet about the inclusion of a LTE radio. Some also make a good argument that it can be made functional. Yes, it has the radio, but not the proper antenna to receive the signal. I’m no engineer I’m just regurgitating what I read on android central. They said there are hardware components missing, and that’s not an easy thing to “hack” onto the device, if even possible. But, I do remember people installing a front facing camera onto the Vibrant 4g, so anything’s possible. So because Androidcentral said so it means what? Did they make the phone to know which antenna it has and which one it doesn’t? Don’t forget that without iFixit none of us would have been talking about LTE on Nexus 4. Not to mentioned that iFixit didn’t mention the particular kind of antenna inside N4. I am not saying that N4 is LTE proof but only Google or LG can answer that question of topic as anything anyone says is mere speculations. They’re a trusty site that’s good at not blowing things out of proportion. I trust their input. It doesn’t mean it’s the final say in all N4 hardware, it’s just a good source. They are a good source as you said and I visit them multiple times daily. With that said until they put out confirm statements from either Google or LG which they usual do, to the dormant LTE radio then everything is speculation. I agree it has the WTR1605L transceiver and MDM9215M Gobi modem, but no LTE specific antenna. But there are certain frequencies that are shared between UMTS and LTE (example 850, 1900 in UMTS is Band 2 and 5 in LTE), and antenna work per frequency not technology so in theory some LTE bands might work, if the Optimus G radio firmware can be used. So , is it illegal to activate and use the LTE on the Galaxy Note II? Or has it already been approved for use as an LTE device? I was under the impression that devices had to be approved for their intended purpose and anything extra ( unlocked by the consumer ) couldn’t be held against the manufacturer. Yes the FCC approved those band when the Note 2 went through. They did NOT acknowledge them for the N4. If you use a device other than the way it was intended there is very little chance the FCC will single you out for punishment. They would have to find you , and prove you did something wrong with your phone: You and thousands of other people that modify there phones. That’s how the FCC will use it’s resources? Thanks for the response. The FCC is not my point. It’s the fact that they didn’t acknowledge them meaning it’s not a functional part of the phone. Obviously they are not gonna come knocking on your door if you super glue some antennas to your phone, it just shows something functionally is missing. The answer to the “Why include it if it has a feature they don’t intend to use” is relatively straightforward. Qualcomm makes chips and does so as cheaply as possible. They know nobody buys a phone caring about what’s in it, merely what the phone can do. It probably costs exactly the same to Qualcomm to make a chip that does LTE+W-CDMA+GSM as it does to make a chip that just does one or the other, for the same reason that it costs a printer the same amount to print a single sheet of letter paper with English instructions on the top and Spanish on the bottom as it does to just print the same paper with English instructions. So they probably offer one chip, “The latest”, to all OEMs. Those companies then decide which features to use (and license patents on, etc) and which to leave dormant. You see this all the time in other ways. There are very few WLAN chips, for example, that do not offer both 2.4GHz Wifi and 2.4GHz Bluetooth. It costs the same to manufacture a chip that does both as it does to make a chip that does either. it would cost more to make three kinds of chips (one, the other, and both) because you lose economies of scale. Cheaper to offer one chip. FWIW, no there’s virtually no chance of the LTE being enabled by third parties. You’d need access to the radio firmware for that, and that’s usually distributed as an undocumented, unintelligible, binary blob. I’ve yet to see an Android distro crack that, and believe me, most want to because that’s often the missing piece when it comes to implementing Wi-fi calling. Qualcomm offers at least a dozen varieties of its latest S4 architecture processors, including with and without radio modem. The most probable reason why the N4 has a modem that could support LTE in theory is because the N4 is based off the LG Optimus G design, and having the same layout could lead to significant savings in the design, manufacture and validation process. It also leaves open the option of introducing future variations with LTE support. The other reason could be (this is my guess) that there is no radio modem with DC-HSPA+ support that does not also support LTE, so the same radio that supports UMTS/WCDMA 42Mbps also can in theory support LTE bands. 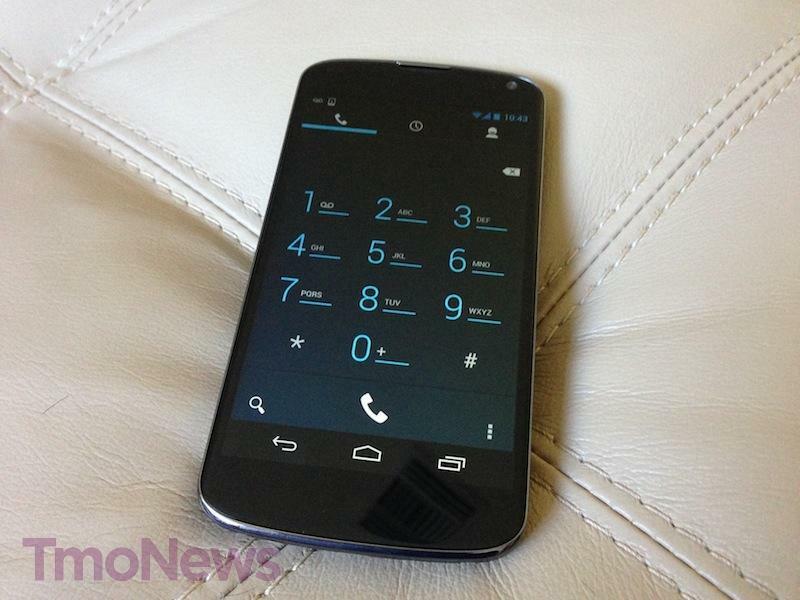 Doesnt matter anyway, the Nexus 24 will be out by the time Tmo has a LTE network. If ever. i have about 5 days to potentially return my VZW SGS3. I’d really like to know this ASAP! I’m working on a workaround that will enable the LTE capability, but I need more than 5 days, maybe in 2 weeks. So far the proof of concept has show positive results, beyond what we expected. However, note T-Mobile does not have LTE, yet. I think Google is teaching Verizon a lesson. Google is not in any danger of losing money leaving out LTE, When people leave Verizon for true unlimited, and better (Nexus) phones, Verizon will likely have a sudden change of heart concerning bloatware, and start partnering for Nexus devices. LOLOL! You are living in an alternate universe if you think that enough people will leave Verizon for this phone. I hate to burst your bubble but Nexus phones aren’t in the same class of sales levels as the SG3 for example. The reason why the SGS3 is selling more is that its on all carriers, and marketing. Now the iPhone is a different league. but if you buy the device they can do nothing to you cause you bought it…right? If it’s based on the Optimus G, is it possible to leverage the code from the Optimus G? But no stock rom. unless you get an aosp rom from the optimus g and transfer all the goodies to a new rom, and load it to the nexus 4. Forget the LTE, If I don’t have a phone, this is all academic. So when are our friends at Google going to let me buy the phone so that LTE or no-LTE is an issue. If you get a Nexus phone and you have the unlimited plan with TMO with no hotspots, will it work if you use the hotspots feature? Can TMO stop you since hotspots is a feature that is part of Android? Not correct. I turned on my N4’s hotspot feature and was sharing like a champ in no time without the $15 add on. This is kind of funny. I’m a T-Mobile customer so even if it did have LTE right now, I couldn’t use it anyway. There are reasons I’m a T-Mobile customer even without LTE, like pricing, GSM, service plan, no contract and Nexus. I dont care about anything now. Just Ship my Nexus 4 now!! You know people just because it doesn’t have LTE right now, doesn’t mean they won’t make a LTE variant in the future.